Diogenes of Oinoanda: Epicureanism and Philosophical Debates, ed. Jürgen Hammerstaedt, Pierre-Marie Morel and Refik Güremen, Leuven University Press, 2017. Al-Farabi (870 AD– 950 AD) and al-Ghazzali (1058 AD – 1111 AD) are among the intellectual giants in the history of Islam. They were separated in time by nearly two centuries but judging from their writings they appeared to have been contemporaries. They belonged to two different intellectual schools of thought, al-Farabi to the Peripatetic school and al-Ghazzali to the school of kalam (“dialectical theology”). Their thoughts have both similarities and differences. Professor Bakar will discuss their similar ideas such as in their acceptance of the ideas of hierarchy of knowledge and tawhidic epistemology as well as their differences with regard to their understanding of the relationship between intellect-reason and revelation, their notions of philosophy, and the relationship between religion and philosophy. 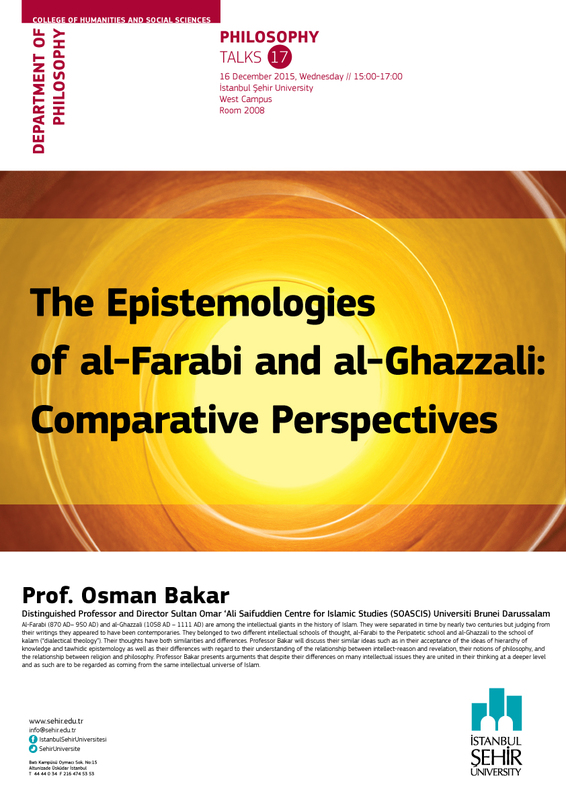 Professor Bakar presents arguments that despite their differences on many intellectual issues they are united in their thinking at a deeper level and as such are to be regarded as coming from the same intellectual universe of Islam. The summer 2010 conference organised by Örsan Öymen at Assos, on the topic of Aristotle’s Politics, has given rise to a volume published by Cambridge and edited by two of the speakers at the conference, Pierre Destree and Marguerite Deslauriers. Details of the conference can be found on the Philosophy in Assos webpage (click on ‘Information’ and scroll down to July 2010). Congratulations to Örsan, and everyone else involved! Those of you who’ve been to one of the Assos conferences, will recognize the view of the Temple of Athena on the cover – the starting point of the conference every summer! 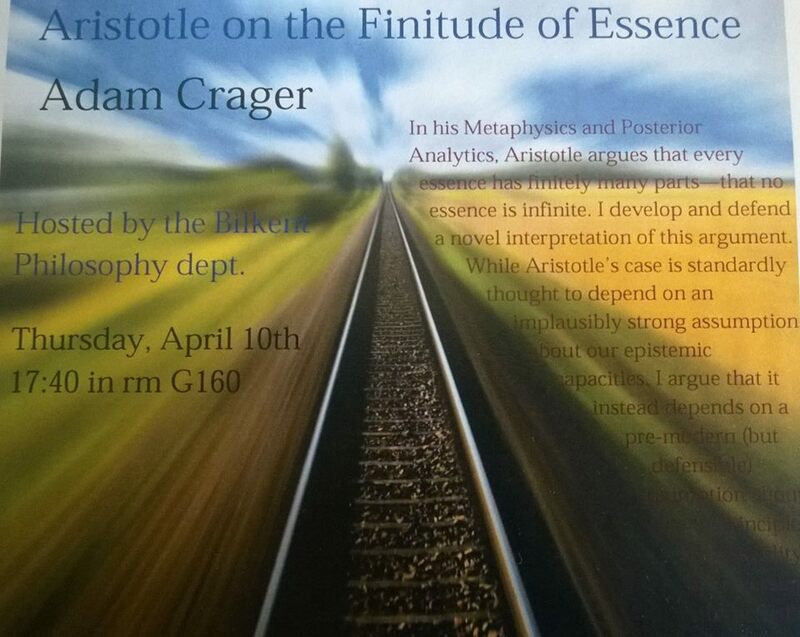 Adam Crager form Princeton University will give a talk at the Bilkent University, Department of Philosophy on April 10, 2014 Thursday at 17:40 o’clock, Room G160. Series of Workshops in Istanbul organised by the Research Center for Anatolian Civilizations. There is a series of workshops organised by the Research Center for Anatolian Civilizations, in Istanbul. Some of these may be of interest to philosophers. The first workshop is on 28/02/2014, and is on “Identity Construction through Materiality”. Details can be found here.